Channel-V is going to organize Inter-collegiate India Fest in January 2012 at Goa like every year. Channel-V India Fest 2012, which provides the platform to showcase the inner talent of yours, is the best way to show that you are a Hero. Nokia & Channel-V organizes India Fest 2012 to bring the talent from College students in various sections like Dance, Debates, Photography, and Business Management etc. • India Fest 2012 Date Schedule: 27th January 2012 & 28th January 2012. • Venue Location of India Fest 2012: Invade, Goa, India. • Prize amount of India Fest 2012 Goa: Prizes of worth Rs.70 Lakh will be given away. It's never too late to become a hero. Channel-[v] brings Nokia India Fest 2012 to give you the platform to showcase that hero within you! Compete with the best of the best and prove to the world that YOU are above the rest. From dance-off's to debates, photography to business-management, whatever your talent, Channel [v] have the stage. 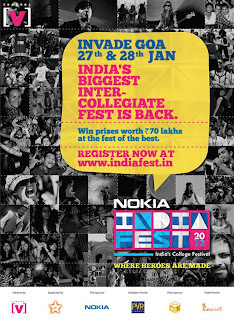 Take on your peers at the coolest & largest inter-collegiate festival, Channel [v]'s Nokia Indiafest 2012 Goa.